How Much Weight Should a Stair Lift Support? Overweight people with mobility issues can face difficult problems getting up and down the stairs in the home. 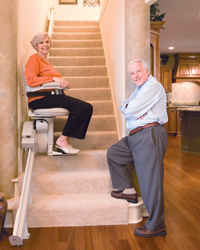 A stair lift is the ideal solution to the problem, allowing them access to other floors in the home without putting extra strain on their muscles and heart. Many overweight people also suffer from vertigo, which puts them at risk on long flights of stairs. The only problem for overweight people using stair lifts is the weight capacity, with most manufacturers offering stair lifts that hold from 280 to 350 pounds. Stair lifts have been designed to accommodate overweight people with extended arm rests with an increased space between them. A sturdy foot rest allows an individual’s weight to be evenly distributed when sitting in the stair lifts. A larger seat size with an extra-long seat belt also assists overweight individuals. Specialized heavy duty or bariatric stair lifts have been designed to carry a person up to 500 pounds. Bariatric stair lifts are designed differently from regular-duty stair lifts. The engine, rails, and seats are larger and stronger. The ride may also be different, as a rider on a standard stair lift faces sideways during the ride, while a rider on a bariatric stair lift faces down to minimize the forces on the rail. Bariatric stair lifts feature a 180 degree swivel chair that is designed to make it easy to get off the stair lift at the upper station. The bariatric stair lift will turn you from the position facing down to a position facing up so you can easily get off the chair. Bariatric stair lifts have a 500 pound capacity, they offer smooth starts and stops with wide comfortable seats that rotate 90 degrees at the top and bottom landings. They also come with a seat and footrest fold to save space with separate controls at the top and bottom of the stairs. Bariatric stair lifts are straight lifts not designed for curved stairs and fitting one into a narrow stair case can be a problem, so it’s important to consult with the manufacturer to determine the stair lift you need and how it will fit into your home. The manufacturer will also provide trained technicians to install your stair lift to ensure it is working properly.